This show was the last concert on the Rolling Stones' 1982 European Tour in support of 1981's acclaimed 'Tattoo You' album which would be their last live tour for seven years. When I last checked out the Rolling Stones live, it came via a concert from the middle of their 1989-90 “reunion tour”. As I mentioned in that review, the 1989-90 shows followed the band’s longest-ever break from the road. With Live at Leeds 1982, we get to see the Stones’ final concert from the 1981-82 tour, a show that looked to fans like it might be their last performance ever. The end of the trek to promote 1981’s Tattoo You, we go to an outdoor festival setting, as the Stones played to about 80,000 people at Roundhay Park in Leeds, England. 1981’s Tattoo You accounts for five of the show’s 24 tracks: “Neighbours”, “Black Limousine”, “Hang Fire”, “Little T&A” and “Start Me Up”. Its predecessor – 1980’s Emotional Rescue - contributes another two numbers with “She’s So Cold” and “Let Me Go”, while 1978’s Some Girls brings us “When the Whip Comes Down”, “Shattered”, “Just My Imagination”, “Beast of Burden” and “Miss You”. 1973’s Goat’s Head Soup delivers “Angie”. From 1972’s Exile on Main Street, we find “Tumbling Dice”, and 1971’s Sticky Fingers delivers “Brown Sugar”. Heading back to the Sixties, 1969’s Let It Bleed presents “You Can’t Always Get What You Want”. 1969 also boasts the single “Honky Tonk Women”, and 1968 gets represented by another 45: “Jumpin’ Jack Flash”. 1967’s “Let’s Spend the Night Together” was also a single, though it appeared on the US version of Between the Buttons as well. “Under My Thumb” comes from 1966’s Aftermath, and 1965’s “(I Can’t Get No) Satisfaction” was another single that popped up on the US edition of Out of Our Heads. “Time Is On My Side” appeared on 1964’s 12X5, and the final two songs represent covers never released by the Stones prior to their live 1981 renditions: the Miracles’ “Going to a Go-Go” and Eddie Cochran’s “Twenty Flight Rock”. If you compare that setlist to the songs the Stones performed on the Blu-ray for their December 1981 Hampton Coliseum concert, you’ll note that they’re nearly identical. Leeds adds “Angie” and drops “Let It Bleed” and “Waiting on a Friend”. Otherwise, they contain all the same tunes – and performed in exactly the same spots. This means two things. First, if you’d like to read my general thoughts on the 1981-82 tour and the “status of the Stones” in that era, please go to the Hampton review. I don’t think it makes sense for me to regurgitate those same opinions for a concert that took place only seven months after Hampton. Second, fans may wonder what they’ll get from Leeds that they don’t already have from Hampton. With only one song not found on the Hampton Blu-ray, obviously the set list doesn’t offer added appeal. If Leeds delivered a bunch of tunes not heard in Hampton, then it’d be easy to see why fans would want to own both, but with nearly-identical sets, the question becomes more prominent. Probably the most obvious difference between the two shows involves their settings. Hampton took place in an indoor arena in front of a relatively small audience; the Hampton Coliseum only holds about 13,000 for concerts, which is a semi-dinky gathering for the Stones. By contrast, Roundhay Park opened up to more than six times that many fans. This alters the concert presentation in some ways, mainly because it gives vocalist Mick Jagger a bigger playground on which to romp. Whether or not that’s a good thing depends on one’s point of view, I suppose. As I mentioned when I discussed the 1990 Tokyo Dome concert, an enormous stage means that various bandmembers may not connect interpersonally as much as usual. This becomes especially true for Jagger, as he uses the breadth of the setting more than the others. Even with wireless instruments, the musicians tend to congregate in a fairly small spot most of the time. They still move around in Roundhay Park more than they did on the relatively small Hampton stage, but they don’t spread their wings a lot. Compared to the excursions he’d take in Tokyo 1990 and other later tours, I suppose Jagger doesn’t go afield all that much, but he still leaves the center stage a fair amount, and that means he doesn’t tend to connect to his bandmates as much as he did in Hampton. Granted, Mick’s always been off on his own much of the time, but the huge Leeds setting makes this literal and figurative distance even more apparent. In terms of performance quality, I liked the Hampton Blu-ray more than I’d expected. As I noted in that review, other documents from 1981 – primarily the concert film Let’s Spend the Night Together and the album Still Life - didn’t show the band in a very good light. However, Hampton sounded quite strong and represented the band better than anticipated. Unfortunately, Leeds brings us Mick in “barked vocals” mode. Every once in a while, he actually kinda sorta sings something, but mostly, he shouts the vocals in a vaguely melodious manner. I’ve heard worse singing from Jagger, but this tendency certainly doesn’t show him in the best light. In addition, when he speaks, he also adopts an exaggerated version of his natural accent that becomes comical and bizarre. Which is too bad, as the rest of the band sounds good. As I’ve noted in other reviews, the Stones can be sloppy, usually in terms of guitarists Keith Richards and Ron Wood. Both acquit themselves well here, however, and the rhythm section of drummer Charlie Watts and bassist Bill Wyman perform ably as usual. I wouldn’t call this a band on fire, but musically, Leeds proves better than usual for the Stones – except for Mick’s vocals. I can live with those musical ups and downs, but the poor direction of Leeds creates the Blu-ray’s biggest drawback. Leeds doesn’t credit a director because it consists of footage shot for video screens used at the venue. That means we get consistently bad photographic choices during Leeds. Nearly the entire concert consists of close-ups – fairly severe close-ups, at that, as the shots tend to stick with heads and little else. Images from the waist up appear infrequently, and actual wide shots manifest themselves even less often. Because of this, we get little feel for the performance. There’s no sense of movement or interaction, as even two-shots are rare. Every once in a while, we’ll see keyboardists Ian Stewart and Chuck Leavell together, and we also find the occasional glimpse of saxophonists Bobby Keys and Gene Barge in the same frame. I’m glad Leeds eschews rapid-fire editing, but the boring nature of the shots becomes a major drawback. I never got a feel for the concert, as the imagery gives us no concept of what the show would’ve been like. The occasional close-up is fine, but we need wider shots to get the right impression of the stage and band movement. Without that, Leeds almost feels like a collection of still photos. Dear God, how many shots of Wyman’s emotionless face can one man take? With a better visual presentation, Leeds could’ve been a good program. Even with Jagger’s less than stellar vocals, the band sounds solid, but the program presents the concert in such a dull, stagnant manner that it becomes a chore to watch. I never thought I’d be so bored by a Stones concert, but the relentless parade of close-ups makes Leeds a sluggish visual experience. 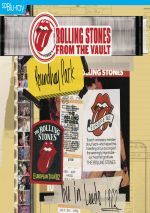 Rolling Stones: Live in Leeds 1982 appears in an aspect ratio of approximately 1.33:1 on this Blu-ray Disc. Given the nature of the source, I thought this became a surprisingly good presentation. Though I complained about the relentless parade of close-ups when I discussed the concert itself, this came with one benefit: sharpness seemed much better than expected. While I couldn’t call the results super-tight, delineation seemed pretty solid for the most part. Occasional wider shots came across as a bit loose, but since the vast majority of the show used close-ups, most of the program seemed reasonably concise. Occasional instances of shimmering and jaggies occurred, though those also largely restricted themselves to those rare wider images. I noticed no edge haloes, and video artifacts from the original tape seemed minimal. Shot largely during daylight hours, colors also fared better than expected. With a variety of peppy hues found in the band’s oh-so-80s wardrobe, the colors looked fairly bright and lively. Blacks were reasonably dense, and shadow detail wasn’t a factor; because the show took place during the day, no real low-light situations arose. Leeds still came with some of the drawbacks inherent to 1980s videotape, but it looked much better than anticipated. I also thought the DTS-HD MA 5.1 soundtrack of Leeds worked well. Like most concert presentations, the soundfield remained focused on the front, where the songs showed strong stereo imaging. Mick’s vocals appeared firmly set in the middle, and backing singing – mainly from Keith – showed upon the side. Audio quality was generally pleasing. The biggest problem with the vocals came from a bit of “stadium echo” at times. This affected Mick’s between-song patter more than actual singing, though, so it wasn’t a major concern. The rest of the track showed good clarity and a dynamic tone. The instruments remained crisp and vivid during the concert. At times I thought bass response could’ve been a little deeper, as the track was marginally thin during some tracks. This wasn’t a true issue – more of a preference – so it didn’t detract terribly from the presentation. Taken as a whole, the audio worked fine. The Blu-ray itself includes no extras, but we do get a booklet. It offers an essay from Richard Havers as well as photos and art from the tour. It acts as a nice complement to the set. The package also provides a CD copy of the concert. Spread across two discs, we find the entire concert. I’m happy to have a portable, audio-only version of the show – especially since I’m not sure I’ll care to watch it again. As a Rolling Stones fan, I’m happy to have Live In Leeds 1982 for historical reasons, but I can’t imagine I’ll watch it much. Musically, the band mostly sounds good, but the visual choices ensure that the Blu-ray can become boring to watch. The Blu-ray offers pretty positive picture and audio along with a CD version of the concert. Leave this one for the diehards – if you want to examine the Stones’ 1981-82 tour, go with the more exciting Hampton Coliseum instead.